Is it Monday already? It’s rainy and gray here in the Midwest, and I just want to curl up on the couch and take a nap with Cookie. I might have to do that later. Today, I’m sharing a recipe from a cookbook I’ve been meaning to tell you about for a while. 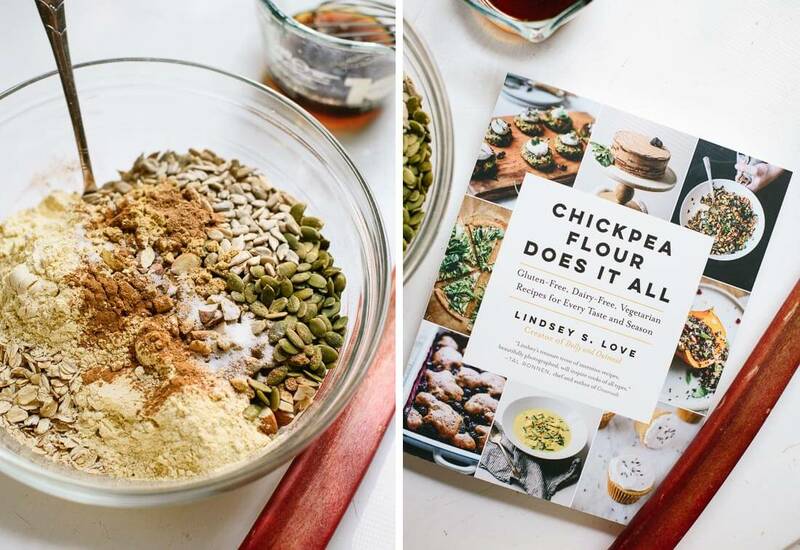 Lindsey of Dolly and Oatmeal wrote and photographed a beautiful book called Chickpea Flour Does It All. I’m always impressed by recipe developers who take on a new ingredient or technique and come up with inventive new uses for it. Lindsey used chickpea flour to create a wide range of gourmet recipes, complete with stunning photos. The recipes in the book are all gluten free, and many include brown rice flour, almond meal and/or arrowroot as well, which may be familiar to you if you bake gluten-free often. 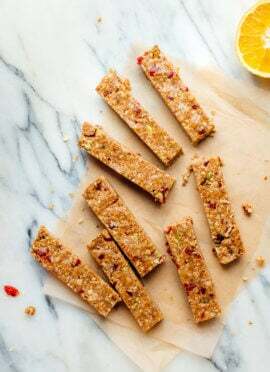 Chickpea flour is just finely ground dried chickpeas, so it’s high in protein, fiber and all of the goodness you can expect to find. You can even make your own chickpea flour in a high-powered blender, like a Vitamix or Blendtec (beware, it’s super loud). Or, you can buy it at well-stocked grocery stores or online (Bob’s Red Mill sells it as garbanzo bean flour). I also used chickpea flour in this socca pizza, which is so good! I hope I’m not sharing this rhubarb recipe too late for you to find it. 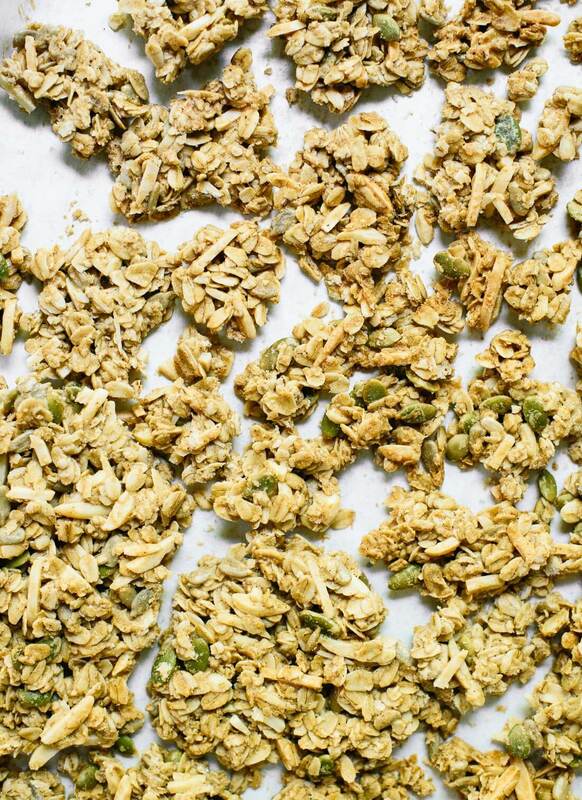 Lindsey’s preparation is super simple and it’s perfect with yogurt and this granola. That said, you could also just throw in some fresh fruit or compote. The granola is truly the most clumpy granola I’ve ever made, thanks to the addition of flour to help it bind. You really have to break it up, or you’ll end up with clumps as big as your hand! Lindsey’s recipe called for brown rice puffs, and I haven’t been able to find those anywhere, so I just added more oats to make up for them. Then, the mixture was too dry, so I upped the amount of the liquid ingredients to match my go-to granola recipe, and it turned out mega clumpy, with an irresistible, sweet and wholesome crunch. You can see the texture best in the photo below, which I snapped after I quit tinkering. This granola recipe is extra clumpy thanks to some flour! This gluten free and naturally sweetened granola is a great way to start the morning. 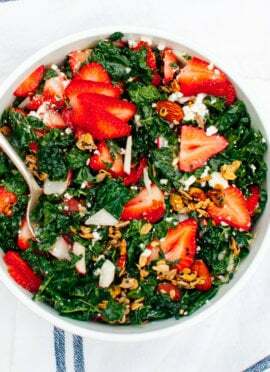 Recipe yields plenty for 4 bowls of yogurt, rhubarb and granola. You’ll have leftover granola, too. To make the granola: Preheat the oven to 300 degrees Fahrenheit and line a large, rimmed baking sheet with parchment paper. In a large mixing bowl, combine the oats, almonds, puffed rice, chickpea flour, pumpkin seeds, sunflower seeds, cinnamon, ginger, nutmeg, and salt. Whisk to blend. In a smaller bowl or liquid measuring cup, whisk together the maple syrup and coconut oil until combined. Pour the wet mixture into the dry, and mix well. Transfer the granola to the prepared baking sheet and use the back of a big spoon or spatula to spread it out into an even layer. For maximum clumps, be sure the granola is in one cohesive layer (it’s ok if it doesn’t quite reach the edges). Bake for 35 to 40 minutes, rotating the pan halfway through, until golden and fragrant. Let the pan cool completely to keep the clumps intact. Gently break up the granola into clumps and store in an airtight container at room temperature for up to 2 weeks (or several months in the freezer). To make the stewed rhubarb: Heat a medium saucepan over medium-low heat. Add the rhubarb, maple syrup, lemon juice, and vanilla bean, and stir. Cover and cook, stirring occasionally, until the mixture is bubbling and the rhubarb is tender and loses a bit of its color, about 8 to 12 minutes. Set aside. 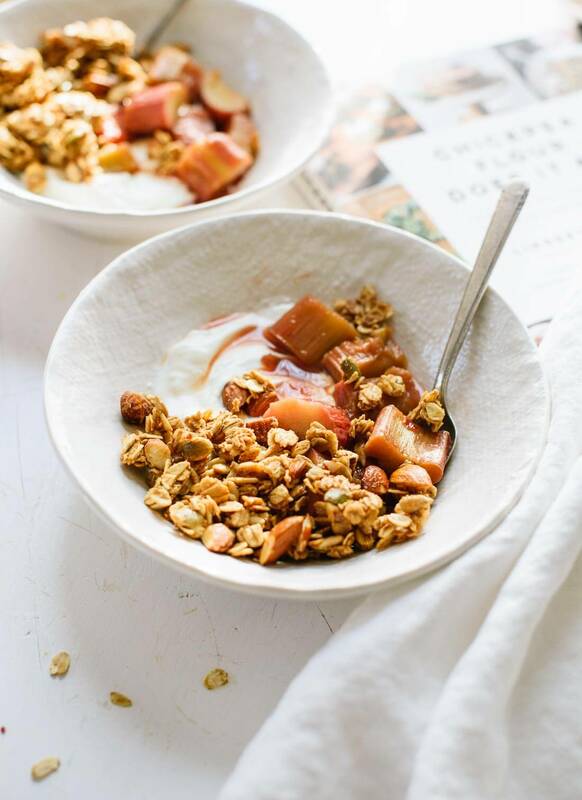 To serve, divide the yogurt between 4 bowls, add ½ cup granola to each bowl (there will be some granola leftover), and then divide the stewed rhubarb into the bowls. Make it gluten free: Use certified gluten-free oats and gluten-free flour (chickpea, oat, all-purpose GF, etc.). Make it vegan: Choose a dairy-free yogurt (Lindsey recommended coconut yogurt) or eat the granola without yogurt. Make it nut free: Replace the almonds with additional pepitas and/or sunflower seeds. Change it up: Feel free to change up the nuts and seeds to use your favorites; just chop any larger nuts first. You could also use honey instead of maple syrup. You can serve the granola however you’d like, of course. It would also be great with fresh fruit or fruit compote instead of stewed rhubarb. Thanks, Susan. 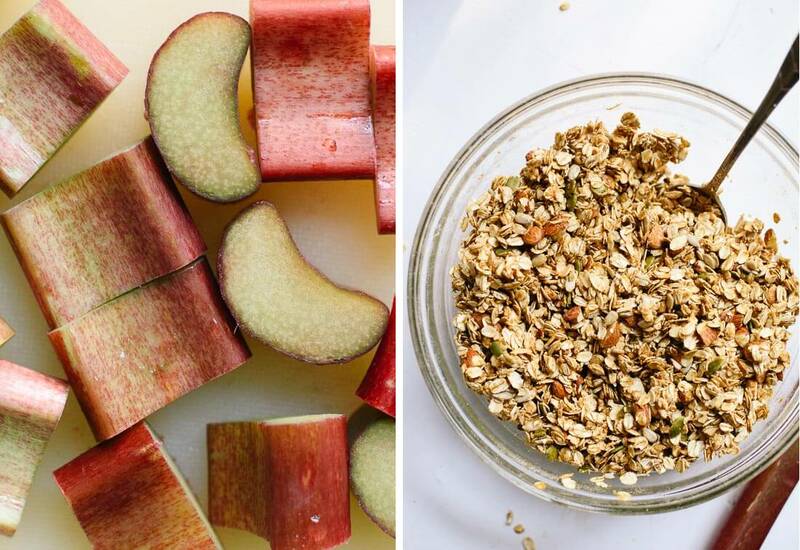 I’m sorry your husband doesn’t love rhubarb. I like it best when it’s cooked with strawberries. You’re right, any fruit would be great here! WOW those clumps look incredible! ‘m OBSESSED with this recipe! I LOVE all things yogurt and granola! Clumpy granola and yogurt is a perfect breakfast! This looks amazing! Those clumps are enormous. I bet this is fantastic with the rhubarb. Just bought Kamut puffs recently at Vitacost.com my new favorite go-to online store for lots of organic and healthy grocery items. I’m sure they’d be yummy in this recipe but they also have brown puffed rice cereal. That is good to know! Thanks, JJ. Kashi has brown rice puffs. Aha! I will look for them. Thank you. That granola looks extra delicious! I’m totally drooling over this Kate. I adore rhubarb. My trouble is wanting to eat it as soon as it’s cooked, before I add it to anything. I’ve seen that chickpea flour is practically a vegan’s fairy dust. It can be used for pastries, “omelets”, pancakes, frittatas, and now granola! This is absolutely beautiful. I love a good chunky granola that can be eaten like a snack rather than as a garnish! Fairy dust, love it! My favorite use for chickpea flour is to make socca, and top it like a pizza! I saw this recipe a few weeks back and made it. It’s a good one! I just wish I followed the recipe more closely instead of cutting back a bit on the maple syrup. I also had to forgo the brown rice puffs as I have no idea where to even find them. On another note, I have this huge bag of chickpea flour that I needed for an Indian recipe. I had no idea how to use it, so I started poking around online and found a bunch of tips. I have been using it as a thickener for gravy or any Asian dishes that require cornstarch for thickening. I use it to coat tofu before deep frying it for Ottolenghi’s Black Pepper Tofu. I’ve also used it to coat fried chicken instead of flour! Use besan with a tad bit of rice flour and spices, chilli powder, cumin, salt, optional scant ginger, a pinch baking powder to make a batter slightly thicker than tempura batter. Dip vegetable pieces in it and fry to make vegetable pokoras (fritters). Indian cooking uses more besan and less all purpose flour, so you should be able to find recipes to use up your bag of besan quickly. Amazing! Love the Detailed Photography! ummm wowowow! This looks like the dreamiest of granolas!!! Awesome recipe! I’m not a big morning person though so I was wondering if you think I could make the rhubarb in advance and use it later on? How long do you think it would last? Yes, definitely! I think it will keep well in the refrigerator for four days or so. The best place to shop for chickpea flour (besan) is Indian section of any grocery store or an ethnic Indian store. 2lbs are usually cheaper than 1lb offered by any brand in the GF aisle. Good to know! Thank you, Barbara. I loved the idea of using healthy chickpea flour in a breakfast food, and it really works :)!! Didn’t have time to make the rhubarb but will try that another time. Followed the recipe except I used about 1.5 tbsp date paste in place of the maple syrup as I don’t like too much sugar for breakfast. This made it less clumpy but added just the right amount of sweetness for me. Just finished the first batch and will be making another ASAP! Thanks for a great blog! Thank you, Cecilia! I’m so glad you enjoyed it! Boo, I’m sorry to hear that! I’m glad it still tastes good. I’m surprised it broke down so quickly, even over medium-high heat. This granola is amazing. I made it on Monday and ate it in two days, and just put my second batch in the over. I also added unsweetened coconut and just sprinkled some chia seeds on top so we will see how it turns out. 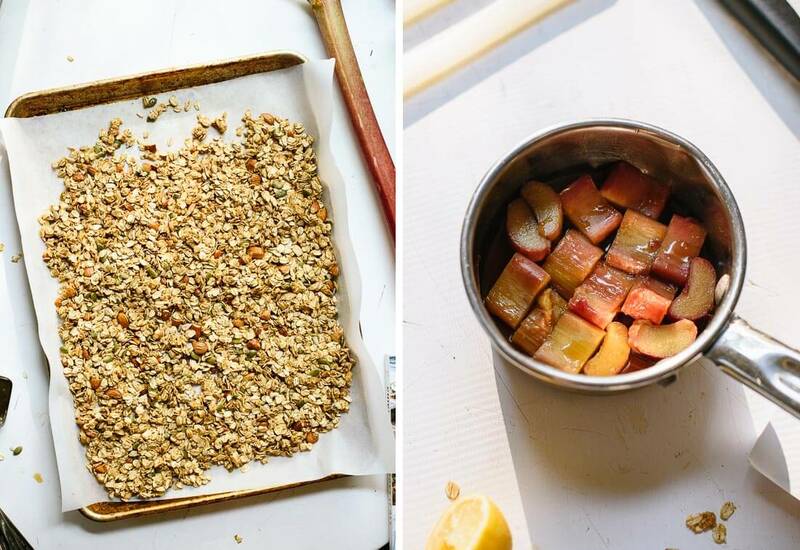 I love granola and am so excited that you shared such a delicious and easy recipe!! It is in the oven. Flour in granola, would have never made that leap alone. Thank-you for this share. I am thinking that with the chickpea flour we are probably getting half our needed protein for the day in this bowl. So looking forward to breakfast tomorrow. I used a coffee grinder for the chickpeas which worked swimmingly to turn them into flour. I made this earlier this week and am totally in love with it!! I think next time I might make it with pistachios instead of the almonds and use cardamom instead of the nutmeg for a new variation. Thanks for the great recipe! 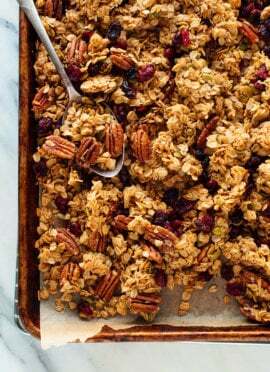 Thank you so much for sharing this Granola recipe. I have tried many Granola recipes with limited success in keeping clumps, but your recipe REALLY does. I’ve passed it on to numerous friends who have tried my batches. I believe Chick Pea flour works best to get clumps – I’ve tried buckwheat and spelt but chick pea definitely gives the best result. 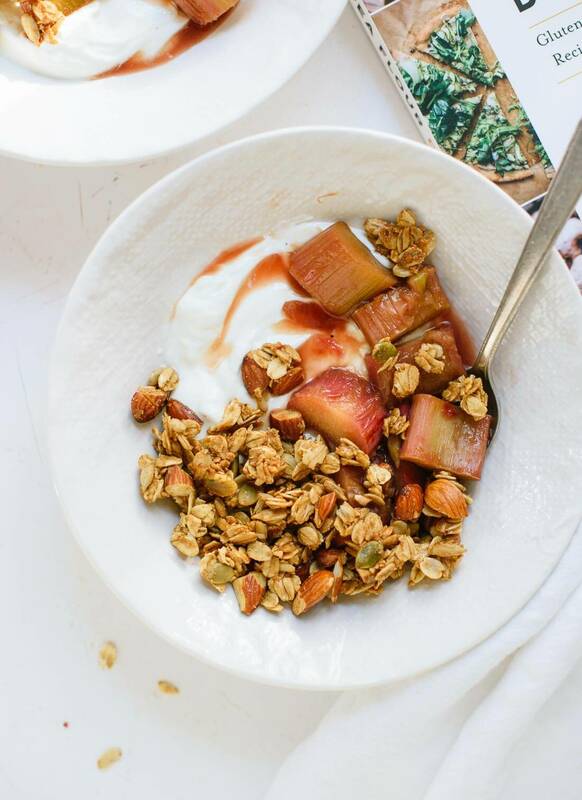 I didn’t serve with rhubarb – rather we keep a jar of Granola, broken into pieces big enough to snack on rather than serving for breakfast. The only amendment I made to the recipe was, to cook at 100c for approximately 45 minutes, as I found cooking at a higher temperature, the edges tended to burn. After spending the Granola thinly on bake paper, I break it into large pieces after it has cooled. This granola is the best that I’ve ever made! I added some chia seeds and ground flax seed to it just for an extra kick and it worked great. Yum! Sounds crunchy and delicious. Turned out very well. Thanks, Kate. Oh I hope this turns out ok! The mixture seemed a bit wet, the wettest granola mixture i’ve ever made… is that normal? Might have to leave it in slightly longer than recipe calls for to help dry it out a bit. How’d it turn out, Ashley?